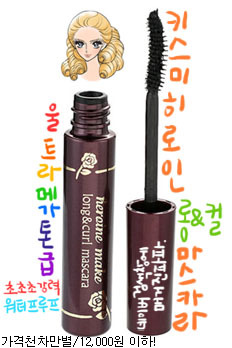 Kiss Me Heroine Long & Curl mascara! I don't really call this mascara. This cosmetic is hard to call as a mascara because it makes the eyelashes very dark and stiff like a chemical. Past after noon eye makeup turns into smoky eyes. So you don’t really get to pay attention to the volume and the curls. This is a perfect item for people who smudges easily. The mascara stays on perfectly. Even volume and curls are very persistent. It really helps people who get easily smudge by the mascara. There are two types in Kiss me Heroine mascara, volume & curl and long & curl. I tried long & curl mascara. There is no smudge and really lasts long. The curl stays really long and it’s very persistent. It depends on how long it holds on the curls and it's very good! I don't know why it became normal as I use it. I finish my makeup really fast and every time I use this mascara there are some black dusts fall down under my eyes or top of my eyes. When you look at the brush, it looks messy and there are some black dusts on it. When I first opened it, I thought it was improper product. However this substance on the brush makes the eyelash longer and persistent. When you slow down in applying it could neatly and cleanly applied. Also it lasts for whole day. Having to apply neatly, use a mascara brush to clean up the dusts so it can last for a whole day very clean. However when you open the cover, it’s really thick and stiff. So it really gets stiff when you use it for several times. Not like other expensive mascara from Lancome and Chanel, they could be use for some amount of time but for this you can’t. However why you use this?, because it’s really a waterproof mascara. Even for raining days, you don’t need to worry about getting smudge. When you even pat tissue lightly on the eyes, it really stays strong as if mascara was not applied. There is official cleanser for this mascara but you don't have to buy it. I am using the Chanel and Etude remover and it works just fine. So don’t get lure by the advertisement and purchase the product. When I look at some of the users of Kiss me mascara, the common similarity is that their eyelashes are stuck together. Also there were some kind of dust on the eyelashes and didn’t apply neatly. In my picture, I brushed with a mascara brush several times and still I achieve some clustering. However Lancome mascara applies neatly with only the mascara brush itself. Kiss me mascara is hard to use. I use it when I really need it. I don't recommend to people who have sensitive eyes. If it doesn’t smudge on your eyes that much then it’s better to avoid strong mascaras. When you want to apply this mascara neatly use with a mascara brush. I received a Shiseido mascara brush as present from my friend but I don't think it’s in Korea. I use waterproof mascara for the four seasons in Korea. However I use when I am doing water sports or any water related activities. 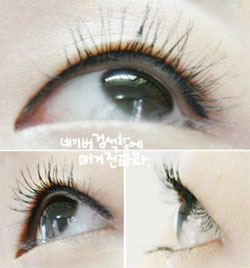 Our Korean eyes tend to get smudge easily because of the short, weak on curls, no strength, no double eyelid and etc. These factors make the mascara to be smudge easily so the strong Japanese mascara works so well as if it's a mighty bond. This product is famous as Kiss me Mascara. Even this is a Japanese product. Unlike Kiss me mascara, the design of the case is in Japanese style making me wanting to buy one. This mascara brush is really stiff making me question if it well apply or give some curls and length. If Kiss me Mascara was better in curling, this one is like making your eyes like a Japanese girl who have their eyelashes standing up. You can defiantly see the lashes getting longer. However when you don’t apply carefully, it might get clustered and little bit of smudging. There are some people who are getting worry by there seriously down eyelashes. Like camel eyelashes, so this mascara is recommend to those kinds of people and it really helps people to make their lashes to give some curls and length. Also it's a strong waterproof that it can play safe and will be satisfy by many people. So try these two mascaras and get the perfect mascara!